A lot of people who have traveled abroad have felt the temptation to purchase property in a foreign country. Weather it is an investment property, a vacation home or if you are moving abroad, buying property in a foreign country can be stressful. Nonetheless, thanks to our modern lifestyle, it is doable! Here are some tips to help you buy property in a foreign country. Conduct a thorough research, neighborhood amenities are a very good start. The locals’ reviews about the amenities are very important. Social media is always a great way to get an insider’s view of the place from the people who actually live there. Also check the area on the map to know the roads and nearby places. And do not forget to check commute times. If you are travelling for work, how much will it take you to commute to and fro? Or if you are buying a vacation home, how close the house is to the local attractions? would moving around be easy for you? As you do your research, it is a good idea to learn more about how the cost of living in the area you are considering compares to what you are currently paying. That way, you can plan ahead and budget accordingly. 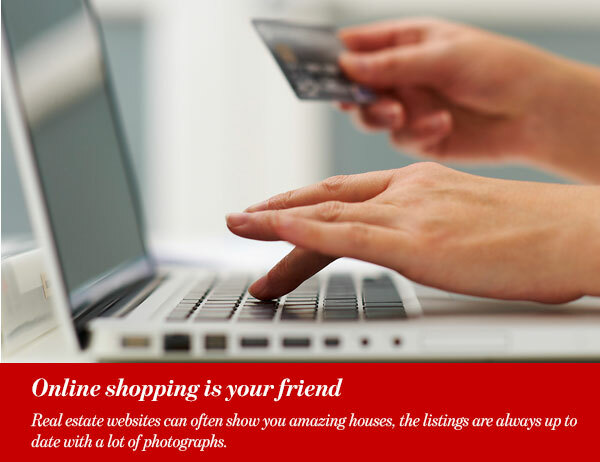 Real estate websites can often show you amazing houses, the listings are always up to date with a lot of photographs. When you find something you like, conduct a more thorough research and start checking the neighborhood. You may find your dream home without even having to leave your desk. Although global property price trends do occur, real estate markets are different in each city. 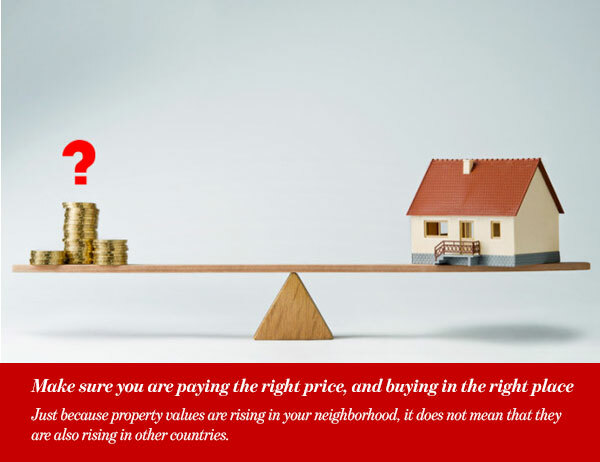 Just because property values are rising in your neighborhood, it does not mean that they are also rising in other countries. Furthermore, some countries prevent or limit real estate ownership by foreigners. Or even if the country you are interested in allows foreigners to buy homes, you may be required to obtain special residence permits or register with a government agency before you can complete a home purchase. So you will want to make sure that you have the legal right to purchase real estate in that country. Additionally, you may want to invest some time in researching the lifestyle and characteristics of the place you want to purchase your property in. Check online for things like population, economic trends, tourism. Try to make sure that your international property purchase is a good investment. You may be lured by the seemingly great deals you can have by buying real estate directly from owners. 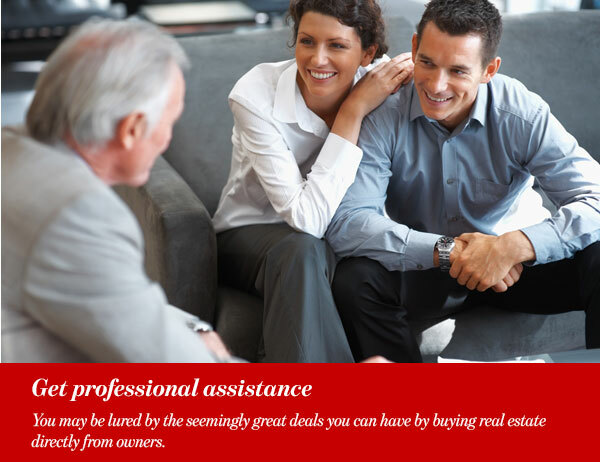 Nevertheless, purchasing through a professional real estate agent or from a reputable property developer can provide useful guidance. It can help you avoid many pitfalls when buying foreign property. Such professionals will make sure that you are properly informed about the details of the purchase. In addition to that, they will usually make an effort to complete the deal and assure your satisfaction with it. Hiring an independent lawyer, who is licensed to practice and is experienced in property sales, is also a very good idea. This lawyer will check all the papers and finalize all the paperwork for you. Before buying a house in a foreign country, it is important to be aware of your legal rights and obligations. Always insist on getting written documents, preferably legally translated to your language, of all agreements and signed contracts. Also make sure to get a receipt for any money paid, or any transactions you make. Tax laws and real estate laws are different in every city. 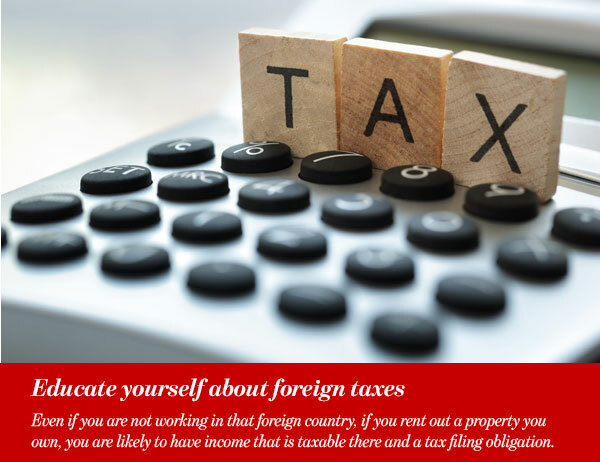 Even if you are not working in that foreign country, if you rent out a property you own, you are likely to have income that is taxable there and a tax filing obligation. Learn all about the tax laws in the country you consider purchasing in. who among us has not dreamed about splurging on an exotic vacation home in a foreign country? But international real estate is more than an impulse buy, or, it should be.